← Name the Snake! … and win $25 Starbucks Gift Card! 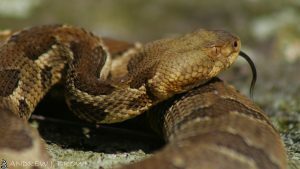 Name The Rattlesnake – Vote Now! Posted on November 29, 2018 by Christopher A.F. Howey Ph.D.
Over the past few weeks, we received 57 name suggestions for the resident Timber Rattlesnake. The members of Dr. Howey’s Lab picked the top 15 names, and now it is your turn to vote for your favorite! Follow the link below and choose the name that you think should win! You can only vote once, and all votes are confidential. Voting will end on December 7th. As a reminder, the person who submitted the winning name will win a $25 Starbucks Gift Card. The Timber Rattlesnake that now resides outside of Dr. Howey’s office (LSC 251) is a female, yellow morph Timber Rattlesnake. In addition to her common name (Timber Rattlesnake), she was also given a scientific name by Carl Linnaeus back in 1758 – Crotalus horridus. The genus, Crotalus, actually means “rattle”, and all rattlesnakes throughout North America share this same genus name with the exception of pygmy rattlesnakes. In addition to these names, Timber Rattlesnakes have also been called the Gentleman’s Rattlesnake because they are less aggressive than other rattlesnake species. The name that we will pick through our competition, will serve as a nickname for our friend that has become part of the Scranton family. To vote for your favorite name, click here! This entry was posted in Outreach, Uncategorized. Bookmark the permalink.